The TRS1 is a unit designed to be used with ratio meters as a high accuracy reference ratio standard. 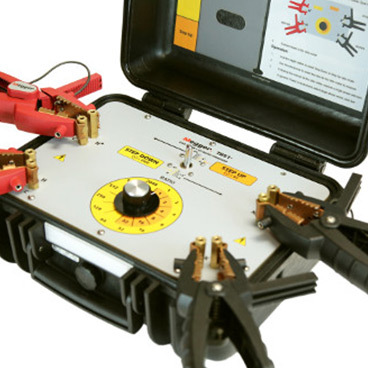 This unique standard is able to provide ratios in both step down (traditional ratio test instruments) and step up (Biddle Hand Crank TTR) test modes. The standard is designed for use as a laboratory calibration standard, or as a portable check standard for field ratio and phase verification of any ratio instrument. The TRS1 can be used with any single phase and three phase ratio meter. Combining three TRS1 units together, one is able to test a Wye-Wye configuration with three phase ratio meters. When testing three phase ratio meters with the TRS1, one uses the instrument’s single phase or three phase excitation for testing. This is meant as a time saving feature, or to validate TTRU3 phase ratio meter models.